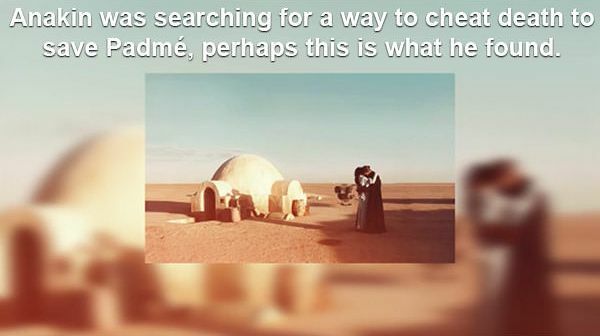 We have seen some absolutely bonkers theories coming off of Star Wars: The Force Awakens. Everything from Supreme Leader Snoke is actually Grand Moff Tarkin, to Poe Dameron is actually a sleeper agent for The First Order. We thought that last one was the craziest theory we’d hear, but this new one takes the cake. One of the other great mysteries of The Force Awakens is the answer to the question regarding Rey’s past. Prior to the movie’s release many believed that Rey might be the daughter of Han Solo. Now many are of the opinion that she might be the daughter of Luke Skywalker. A new theory supposes that she is related to Luke, but she’s not his daughter. She’s his father. Ok, stick with me people because this one gets a little (a lot) crazy. The theory, which is laid out in pretty terrible English, but with a decent production value, on 9gag.com believes that Rey is actually the reincarnated spirit of Anakin Skywalker. The evidence for this theory is tenuous at best. 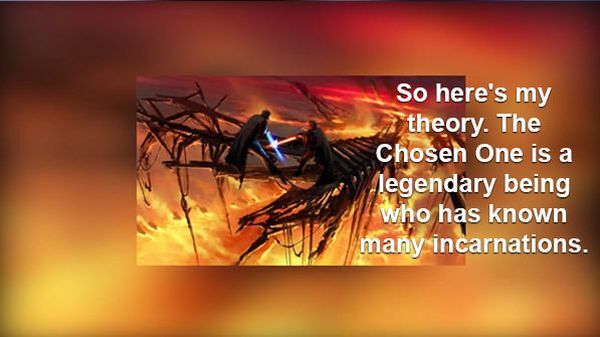 It starts off by giving us some connections between Rey and Anakin as far as their general abilities. Rey is a pilot, she seems to be good with droids and other mechanical things, and obviously has the ability to use The Force. 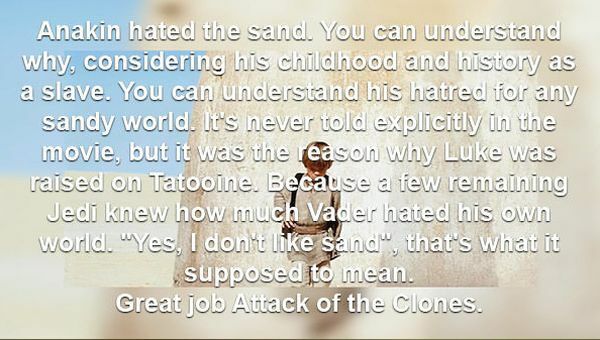 These are also things that Anakin was good at. While true, the connection is tenuous at best. Exactly how the "reincarnating" happens, however, is a little vague in the theory. At one point, the post claims that Anakin may have learned how to do it as part of his desire to cheat death and save Padme. While at another point the theory claims that "The Chosen One" who Anakin is supposed to have been, has actually been reincarnated several times over the generations. The theory can't make up it's mind how this works. This part of the theory is actually pretty entertaining, as it surmises that the reason Rey ends up on Jakku is as punishment for her (his) previous bad acts. Anakin says in the prequels that he hates sand, so Rey ends up on a sand world as a kind of purgatory. Needless to say, the theory is full of holes. It believes that the reason that Rey has visions of the past when she touches the lightsaber is because it’s actually her lightsaber, viewing her own past, and future. It conveniently ignores the visions of the destruction of Luke’s Jedi Temple, which Anakin was certainly not around to see. The theory is insane but it’s still entertaining. What do you think. Is there anything worthwhile here, or is it all complete nonsense?